The file sharing with small or large groups often becomes far more difficult than you would expect. This is particularly true when we’re talking about marketing organizations or departments. For example, if you had a batch of case studies or other marketing materials being put together for one client, you most likely want a way to manage that on a mobile device. Marketing Automation App should be very helpful in this case. Therefore, we put together a simple mobile marketing app that allows you to specify your clients, upload the marketing materials and even adjust client information on the app. What’s more is that you don’t have to worry about when workers make modifications to the documents. All of the changes are kept up to date without the need to manage complex workflows. If this mobile marketing app intrigues you, keep reading to see some screenshots, and to see if it could work in some way for your organization. Also, you can download the Marketing Automation App right here. Who is the New Mobile Marketing Automation App Designed For? The initial thought when designing the app was to help out marketing firms that want to compile the loads of mobile marketing materials they have. At the same time, we wanted to make the process of collaboration and sharing more fluid. Therefore, we highly recommend that mobile marketing organizations take a look at the app. At the same time, there are no restrictions as to the companies that could take advantage of this. We suggest that marketing departments from all sorts of businesses consider the mobile marketing app. This way, if you need to store PDFs, JPEGs or other files in a mobile format, this is the ultimate solution. Then, if one of the people on your team need to edit one of the items or show it to a client, all they have to do is open up the app. What Can You Expect From the Mobile Marketing Automation App? One of the main reasons we’re so proud of this app is because it looks sleek and simple. It lets you adjust the list styles for browsing all of your clients or marketing doc categories. For example, you can show off logos from the companies or switch to more of a list format. Syncing your docs only takes a click of the button, sending the updated docs to all of the people who have access to the app. 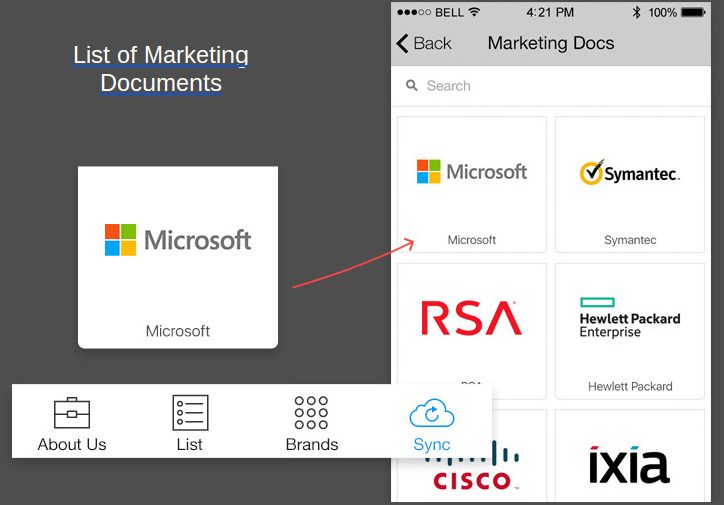 When selecting one of the marketing doc categories or clients, you’re shown a list of the marketing docs saved. One feature we enjoy is the Search bar, since you may not want to go hunting for a document for five minutes. Other than that, all you have to do is click through to one of your documents in order to download it. 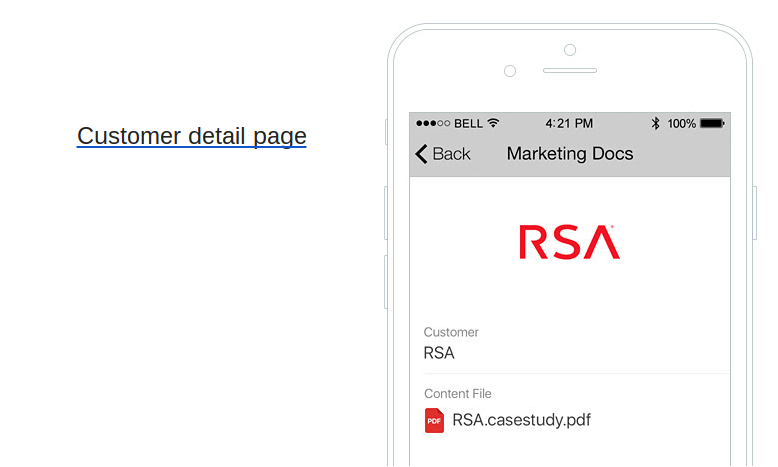 In this demo, we clicked through the RSA customer detail page. It’s a rather simple section, with a logo and name for your client, along with the files you currently have. 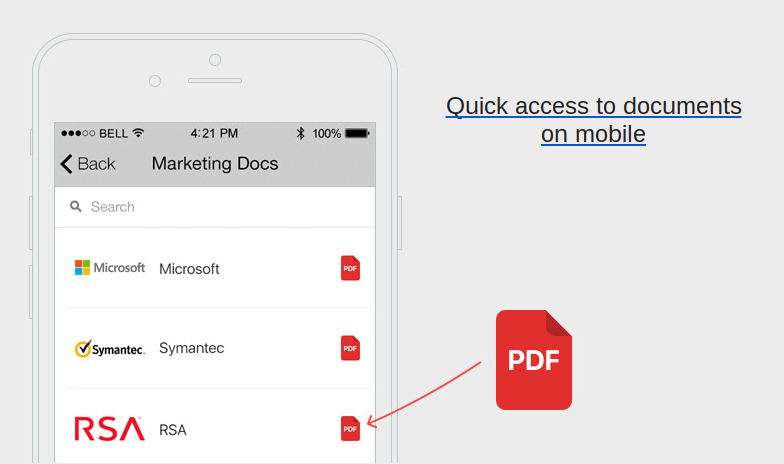 Therefore, if you had a PDF file in the customer page, all you would have to do is click on it to download it into your mobile browser. The benefits of the mobile Marketing Automation App far outweigh some of the other options out there. For example, handling a file storage and sharing app like Google Drive becomes clunky and complicated on a mobile device. In addition, you often have to pay to upgrade your storage settings, and it’s not always easy to view mobile files through these apps. Therefore we highly recommend checking out the mobile marketing automation app, and feel free to drop a line in the comments section if you have any questions about it.